In a dramatic reversal of numbers, the March 2019 National Instand background Check System (NICS) check numbers are the second highest March on record, only a few percent less than the record breaking numbers in March of 2018. 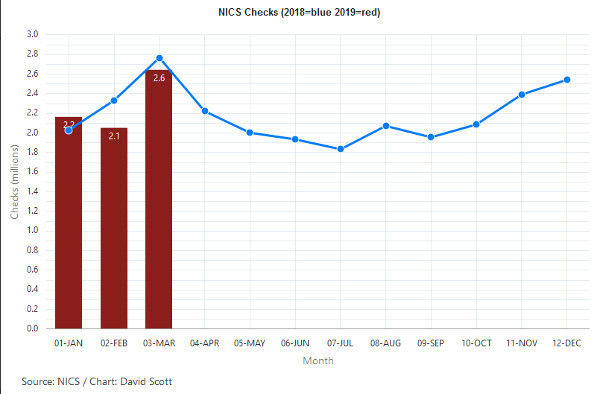 February numbers had shown a dramatic downturn for NICS checks. With permits and permit rechecks, and with the increasing numbers of permit holders who do not need another NICS check in order to buy firearms from federal dealers in 25 states, the NICS checks are becoming less correlated to firearm sales. Firearms included in the estimate totals are all those produced and imported, as estimated since 1900. Those estimates were recorded by previous researchers Newton and Zimring, and updated by award winning scholar Gary Kleck though 1987. The Kleck numbers are available in his book, Point Blank: Guns and violence in America.